- Hype Bros beat Blake & Murphy. During the Hype Bros celebration, Mojo Rawley picked up an adorable child and flew him like an air plane. - Elias Samson beat Patrick Clark. 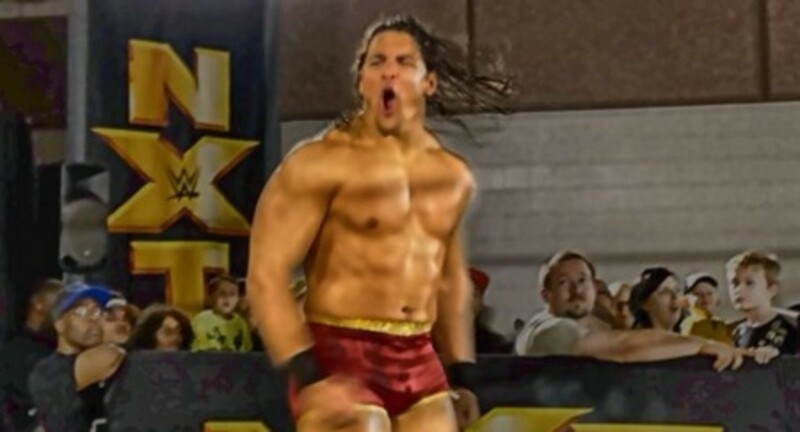 Samson taunted the crowd with a song before the match. - Liv Morgan beat Adrien Reese with a moonsault splash similar to Alexa Bliss' finish but facing away on the top turnbuckle. - Levis Valenzuela beat Steve Cutler. A lot of comedy and the fiesta rolls on. - Jason Jordan & Chad Gable beat The Vaudevillains. Match of the night in the ring, these two teams work well together so that's no suprise. - Apollo Crews beat Tino Sabbatelli. These two have been having good matches lately. - Interview segment w/ Mandy Rose. She was heckled, and "What? "'d down while promoting Total Divas. - Asuka beat Alexa Bliss via submission with the Asuka Lock. - Sami Zayn, Enzo Amore, & Big Cass vs. Riddick Moss, and NXT Tag Team Champions Dash, & Dawson went to a no contest when Moss was apparently injured during a triple suplex spot. The referee put up an X and the medical team assisted Moss. Sami let the people know Riddick said he'd be okay, and the good guys hit finishers on the tag champions to send everyone home happy.